A bad landlord damages a community, sometimes with serious consequences. In the case of Ved Parkash’s 750 Grand Concourse, the building’s long-term rodent infestation problems recently flared up into a major public health scare. Tenants in Parkash’s buildings have been dealing with problems for years, including poor conditions, vermin, and scores of potentially meritless eviction proceedings for nonpayment of rent. He is a regular on the Public Advocate’s Worst Landlord List. Then things got much worse. Last week, newspapers reported that the building is stricken with a rare rat-transmitted illness that sickened two people and killed one. But conditions like these are nothing new with Ved Parkash. His lender – Signature Bank – should have known better. Tenant organizers at New Settlement Apartments Community Action for Safe Apartments (CASA) and the Northwest Bronx Community and Clergy Coalition (NWBCCC), along with legal support from the Urban Justice Center (UJC), have long been working with tenants in multiple buildings owned by Ved Parkash. Tenants from these organizations publicly announced the formation of the Parkash Tenants Coalitionin June 2016, which includes residents in over 10 buildings who are working collectively to address issues in their homes. The coalition is currently suing Parkash in housing court over four buildings where Signature Bank holds the mortgage, including 750 Grand Concourse, 1530 Sheridan Ave, 2454 Tiebout Ave, and 315 East 196th St. In addition to being on the list, conditions at 750 Grand Concourse and other Parkash buildings were covered by the press before this loan was made, including a January 2016 Bronx News 12 story. “At another of Parkash’s buildings, this one on Grand Concourse, another tenant’s ceiling is falling apart due to a leak,” the story reported. “Alice Funmilayo, 70, says that the damage returns every winter. Nothing, she says, is permanently fixed.” Signature Bank was notified about both of these buildings in ANHD’s letter to the bank and its federal regulators at the time of their 2016 Community Reinvestment Act (CRA) exam. One month later, the bank made the loan. 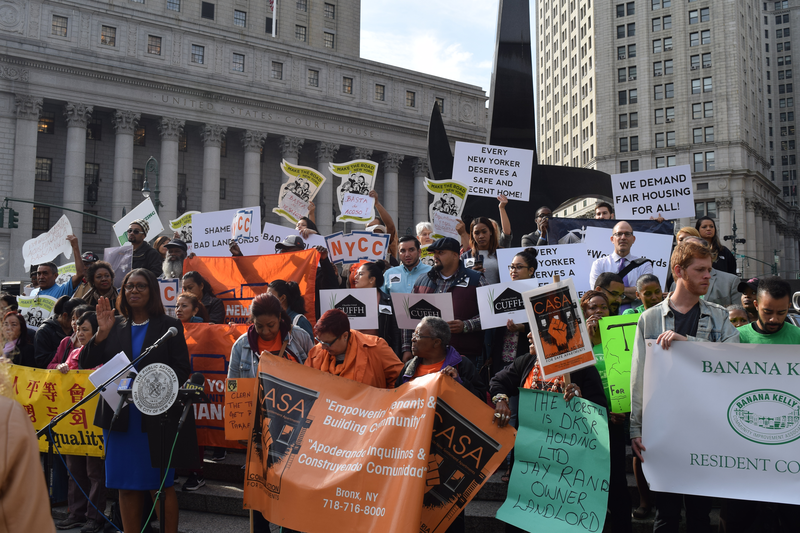 Tenant organizers at CASA have been working in 750 Grand Concourse since September 2015. Organizers have witnessed serious leaks, rampant vermin, paint peeling (including lead paint), bathroom appliances detached from the walls, and shoddy repair work. One woman’s toilet and sink were removed and dumped in her bathtub in order to “replace tiles,” where they remained for several days. While holes get loosely patched over, tenants have been without access to their laundry room for over a year because Parkash has not fixed a gaping hole there. An April 2016 Daily News article about a tenant-led housing court lawsuit leads with the rat problem; “Inside a building on the Grand Concourse blocks from Yankee Stadium, Rico Moreno hears rats scratching at his rotting bathroom tiles when he tries to take a shower,” the article read. While the number of HPD violations may have gone down in recent months, especially after tenants sued Mr. Parkash for repairs, this February 2017 New York Times article about the recent tragedy outlines longstanding issues in the building, as well as the fact that the Department of Buildings Commissioner reported 750 Grand Concourse as having “some two dozen open violations against the property.” The article also describes how tenants have suffered through his behavior for years. Yet, Signature ignored the problems, and even continued to work with him by financing his most recent purchase of 2905 Kingsbridge Terrace and 2988 Kingsbridge Terrace with a $16.5 million mortgage. UPDATE: And in early February, Signature made another $5 million loan to Parkash to finance his latest purchase of 11 West 172 Street. The Toledano Tenants Coalition has also asked Signature Bank to be accountable for their lending. They represent tenants from buildings owned by known bad-actor landlord, Raphael Toledano. Signature made a collateral loan to Madison Realty Capital backed by these buildings. Lenders must be held accountable for the impact their lending to bad-actor landlords has on communities. This is especially true for lenders like Signature Bank that are covered by the CRA since banks can get CRA credit for loans on apartment buildings where the rents are affordable to lower-income tenants. But regulators are becoming increasingly aware of the problems caused by bad landlords and bad underwriting, and will sometimes not give CRA credit if the buildings are in bad condition or if the loans lead to displacement or a loss of affordable housing. This is clearly the case with 750 Grand Concourse and other Parkash loans. It is time for Signature Bank to reform its practices and make a stronger commitment to responsible multifamily lending in New York City.